2008 Annual Report – Direct Action Welfare Group Inc.
DAWG hosted a Train the Trainers Immersion Trip in conjunction with Poverty Initiative at Union Theological Seminary of Columbia University. The trip was attended by students and faculty from 12 different colleges and universities including Columbia University, Ithaca College, Boston University, Union Theological Seminary, City University of New York, Cabrini College and Methodist Theological School. The participants learned about West Virginia’s rich heritage and long history of organizing for change. Participants visited Matewan, Chestnut Ridge, Kayford Mountain, Charleston, Wheeling, and Big Ugly. They visited Headstarts, community centers, and soup kitchens. They spent time getting to know people and learning about the organizations working to make change in West Virginia. DAWG has partnered with Family Leadership First to present workshops all over the state as part of their Family Links Trainings. DAWG presented our Quick Reference Guide to Public Assistance in WV training as part of the Family Links trainings. Through this partnership we trained 24 individuals in 2008. DAWG and Teen DAWG participated in the Appalachian Studies Association Conference where DAWG appeared on a panel to discuss the Appalachian Action Coalition. Teen DAWG participated in the Voices of Appalachia Portrait Exhibition. Members of Teen DAWG were invited to attend a Youth Summit in New York City sponsored by the Poverty Initiative. Youth from New York City, Philadelphia and rural Pennsylvania also participated in 2 days of discussion about youth in poverty. Teen DAWG participated in a youth exchange with Philadelphia Student Union (PSU). PSU youth visited West Virginia where they met with Teen DAWG youth and toured the Charleston Area. The youth also visited Kayford Mountain where they saw a Mountain Top Removal Site. Later in the year youth from Teen DAWG visited PSU in Philadelphia where they attended a meeting to discuss school funding issues in Philadelphia. Over 150 people attended the14th Annual Family Leadership Conference that was entirely planned by DAWG The conference is provided through a partnership of Family Leadership First, Direct Action Welfare Group, Mountain State Direct Action Center, Mountain State Parents— CAN, and Step By Step. Families from all over West Virginia participated in a weekend of learning and networking. Workshop topics included Money Management, Identity Theft, Medicaid and Your Rights, Legislature 101, Internet Safety for Parents, and IEP and Special Education. Guest speakers at the conference included Jason Najmulski, the Commissioner of DHHR Bureau of Children and Families and Benita Whitman. This is DAWG’s fifth year being a co-sponsor of this event and first year planning the entire event. DAWG, through our Teen DAWG program, brings teens together from all over the state for meetings to plan and facilitate the Teen Track at the Family Leadership Conference. 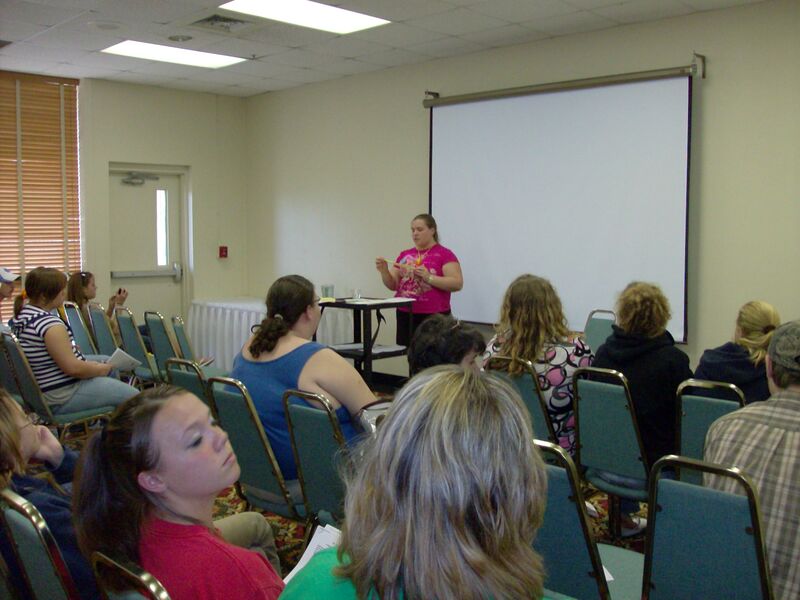 The teens choose the workshops topics and present the workshops for other teens and their parents. Teen DAWG has spearheaded this since the inception of the Teen Track in 2006. The Teen Track offered workshops for high school aged and middle school aged youth. Workshop topics included Bullying, Internet Safety, Fitness, Parent/Teen Communication, Protecting Yourself, and Drug and Alcohol Awareness. February 19-22, 2008 in conjunction with the inauguration of Professor Paul Knitter to the Paul Tillich Chair, the Poverty Initiative at Union Theological Seminary of Columbia University presented:“Religions of the World and Poverty: A Symposium.” The Symposium brought together renowned spokespersons from religious traditions around the world to meet with local activists, religious leaders, and poor people to explore ways of collaborating to achieve economic justice. Presenters included Professor Paul Knitter , the Venerable Dhammananda of Thailand, Dr. Ved Shravah , Dr. Asghar Ali Engineer of India , Rabbi Levi Weiman-Kelman of Israel, Imam Talib Abdur-Rashid and Chief Oren Lyons of the Onondaga Nation. DAWG’s Executive Director, Evelyn Dortch, had the honor of being one of the poverty scholars invited to participate in this historic event. DAWG and Teen DAWG members were among the 45 veteran and emerging low-income leaders nominated to participate in Union Theological Seminary’s Poverty Initiative’s first class of Poverty Scholars. The Poverty Scholars Program develops and expands upon an innovative, intellectually rigorous, human rights based, popular education program/curriculum for grassroots activists towards building a movement to end poverty. DAWG joined with other members of FACES on Medicaid to call for the suspension of the state’s new Medicaid program Mountain Health Choices because of the negative impacts the program was having on families in West Virginia. DAWG also released a survey of Medicaid recipients and Providers which substantiated our claim that people were not properly informed about the new program and thus were not receiving the care they needed. Our survey was the first released using data collected from actual program recipients. « DAWG distributed information about applying for school clothing vouchers and other benefits to 1,000 low income families. « DAWG distributed information about the Earned Income Tax Credit, Child Tax Credit, and free tax preparation to 1,500 low income individuals. « DAWG provided funding for low income individuals to participate in Children’s Day at the Legislature, Family Leadership Conference, meetings in New York, Philadelphia, and Washington DC, regional and local meetings, and to attend trainings. « DAWG distributed newsletters to over 1,000 low income families quarterly. « Our Executive Director, Evelyn Dortch, was a guest speaker on a panel about economic justice during Ecumenical Advocacy Days in Washington DC. « DAWG held a strategic planning retreat where the mission was revised and a values statement were developed. « DAWG completely revised our website making it more user friendly. In the week following the release of the Mountain Health Choices Survey, we received over 2,000 hits on our website.